SMTP TLS allows email messages to be transmitted from the sender’s email server to the recipient’s over a secure channel that prevents eavesdropping. TLS is an extremely useful and popular technology as it is seamless — the sender and recipient do not have to do anything special — and provides a level of server-to-server security important for compliance, HIPAA, and privacy in general. 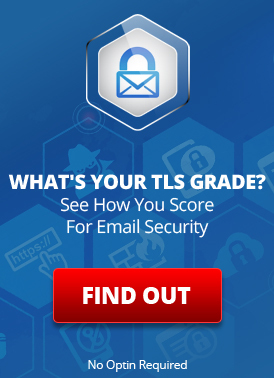 Use of SMTP TLS requires that both the sender’s and the recipient’s email servers support it. For example, LuxSci’s servers support TLS and will “talk TLS” to any recipient server that also does. Many of our security conscious customers also want to ensure that people only send messages to them over secure channels. Our SecureLine SecureSend portal is one way to do that — anyone can login and send free email messages to our SecureLine-enabled users. However, there is no way to stop someone from just “emailing you” anyway, even if the email ends up being insecure. Send an auto-response to the sender explaining that their message arrived insecurely and was discarded. Customers can use this new TLS identification feature to inform senders of the insecure nature of their messages, advertise how to send messages to them securely, organize messages based on security, etc. How would you go about notifying senders of their non-use of TLS? Here is a recipe for creating a nice looking robust notification to your senders when they send you messages that do not arrive over TLS. Note that even if a message arrives without TLS, it could still be secure if it uses other encryption mechanisms (like PGP or S/MIME). This entry was posted on Thursday, June 7th, 2012 at 10:03 pm	and is filed under LuxSci Library: Security and Privacy, New Feature Announcements. You can skip to the end and leave a response. Pinging is currently not allowed.